We at KillerRONS.COM believe that methanol is one of the most misunderstood and misrepresented components used today in sportsman drag racing. Methanol (“Alcohol” as it is referred to by most) is used by a minority of racers but their successes are seen all over the country every weekend in numbers that are significantly out of proportion. Alcohol is used by Super Pro National champions, Lucas Oil Divisional Series champions, winners of “Big Money” bracket events and countless local event and track champions every year. Even with these obvious successes, this fuel suffers from a severe case of poor public relations. This bad P.R. ranges from engine builders who discourage it based upon their personal dyno findings to racers who possibly had a poor experience with the fuel to individuals who have no personal experience and are only passing along hearsay. One of our main goals at KillerRONS.COM is to educate existing or future “Alcohol Racers” with solid information that will help them utilize what we believe to be the best fuel for most applications. In this article we will focus on “Seasonal Performance” and how it relates to the consistency of your racecar through your racing fuel of choice. Throughout a season most of us will race in a wide sampling of weather conditions. These conditions range from cool and dry in the spring to extremely hot and sticky in the summer months. The unpredictable fall weather can bring both extremes and everything in between. As the weather changes from season to season none of us are immune to experiencing peaks and valleys in performance. Unfortunately some combinations are affected more than others. If you are part of this group you may be suffering from the anxiety brought on by what we like to call “Seasonal Performance”. When racers call KillerRONS.COM inquiring about switching to an alcohol fuel system they are asked a series of questions. An overwhelming majority of inquiries are from gasoline users wishing to switch fuels. One of the first questions they are typically asked about is their current performance numbers. 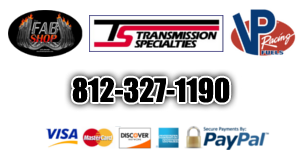 The answer almost always begins with a statement such as, “In the spring my car ran pretty good but it is currently running significantly slower than that.” The good news is that it doesn’t have to be this way and these callers are usually convinced of that based upon competitor and friend's experiences. Racers who choose alcohol for their engine have a race car that is nearly as quick and fast in the dead of the summer as it is in the early spring or late fall. The goal of this article is to provide you with a general understanding of “Seasonal Performance” and offer our ideas as to why it occurs. Specifically we will discuss why burning alcohol in your racing engine will make it less reactive to atmospheric changes during the changes of the seasons. This tighter seasonal “window” will unquestionably translate to a more consistent car from week to week, day to day and most importantly from round to round. Previously, we wrote a driver tutorial called “It’s in the Details” for www.thisisbracketracing.com. That article focused on the preparation of the race car as well as the mental preparation of the driver. The explanation to “Seasonal Performance” can also be found in the details……the details pertaining to the weather. There are three main variables that affect an engine’s ability to make power and directly impact a race cars on-track performance. These are temperature, water vapor and barometric pressure. Below we have simplified how “The Big Three” relate to and affect alcohol and gasoline burning engines differently. When comparing these fuels and examining a race cars summer-time performance it is commonly accepted and understood that both fuels will show a loss with the higher temperature, higher water vapor and lower barometer. The key is to understand how and when your fuel of choice is affected by these variables and how much (and how quickly) a variable can change during a race day or weekend event. We can begin this process with the three simple sentences below. An engine burning gasoline is more affected by temperature changes than an engine burning alcohol. An engine burning alcohol is more affected by water vapor changes than an engine burning gasoline. Both engines burning alcohol and gasoline are equally affected by barometric pressure changes. Temperature is listed first among “The Big Three” because it is the most volatile of the three. It undergoes the most drastic changes and it does it the fastest. Water Vapor is typically more stable than temperature and doesn’t change that much over the course of an event. Barometric pressure is the most stable of the three over longer periods of time. This leads us to one of the most important sentences of this article. Due to alcohol’s decreased sensitivity to the variable that is the most volatile its performance is less affected than gasoline. This is precisely why alcohol is believed by most to be the more consistent performer of the fuels. It is our experience that alcohol's performance is changed about half as much as gasoline with the typical changes in air conditions. This has been verified time and time again when we question racers and customers who have made the switch from gasoline to alcohol and we believe it is backed up with the technical information supplied below. Before we get deeper into why alcohol behaves the way it does we need to explain how the density of the air affects an engine’s ability to make power. In simple terms air density refers to the amount of oxygen molecules that are packed into a given space as it enters the engine. The more oxygen-rich the air coming into the engine is the more power potential is has. This is true for both alcohol and gasoline burning engines. What makes air more or less dense you ask? You guessed it…back to “The Big Three”. Higher water vapor makes the air less dense. Water vapor also disperses the oxygen molecules but to a lesser extent than temperature. Lower barometer makes the air less dense. Less pressure means less of the same thing packed into the same space. How is air density measured? Density Altitude is the common measurement of the air’s density and is used by many racers as a means for predicting their racecar’s performance. Most weather station and prediction software companies hold their equations “close to the vest” but rest assured temperature and barometric pressure carry the most weight while water vapor is factored in but to a much lesser extent. The fact that temperature has such a large impact in this calculation is why density altitude is an excellent measurement tool for predicting a gasoline engine’s performance. Keep in mind that most of the weather station and prediction market is driven toward the large bias of gasoline racers in the “super classes” requiring the devices as well as upwards of 70% of the general bracket racing public still utilizing this fuel. It is no surprise that the largest amount of research and development has been focused in the gasoline prediction arena. Simple reason…it is the most needed. Due to the fact that water vapor isn’t significantly factored into the density altitude calculation we feel "D.A." isn’t a very good tool for predicting an alcohol fueled engine’s performance. The logical question at this point is why alcohol is less affected by temperature than gasoline? This is due to alcohol’s extremely high oxygen content. To be exact alcohol is 49.93% oxygen. Since oxygen is contained within the fuel the intake charge is naturally more dense with a constant oxygen source. This gives alcohol the inherent ability to resist the density robbing effects of higher temperatures. By carrying its own oxygen to the combustion chamber alcohol requires a much lower air-fuel ratio as gasoline (about half). Alcohol generally needs to be run at a 5.4:1 ratio while gasoline at 12.5:1 ratio under power in a high performance engine. This means that there is less (yeah…about half) of the temperature affected atmosphere in the combustion chamber with alcohol. This minimizes the effect of the air density in the intake charge so there is less change in power to the good or bad due to temperature changes. A good comparison is to think of a nitrous oxide assisted engine. I’m sure you have heard the phrase "atmosphere in a bottle", well alcohol is “atmosphere in a fuel”. Race fuel companies are not lost on this and have began offering oxygenated gasoline in recent years and it has become very popular among gasoline advocates. These fuels do begin to show a slight resistance to temperature changes but they are still not NEARLY as oxygenated as alcohol. This is precisely why you see and hear these oxygenated fuels compared to and offered as an alternative to alcohol in advertising. E85 is becoming a very popular pump fuel that has approximately 60% the oxygen content of alcohol, which makes it a good alternative to gasoline if you are limited to a pump gas application. You may be asking what makes alcohol more sensitive to water vapor and how do I use this to monitor and predict my alcohol engine’s changing performance? Alcohol is hygroscopic which means that it will mix with water. As it relates to our racing this means that it readily absorbs the water content in the atmosphere. Gasoline is not hygroscopic so it will not mix with water, therefore its power producing potential isn’t reduced as dramatically when the water vapor rises. Since the water content in the air mixes easily with the alcohol it is able to dilute the fuel’s potency thus reducing the engine’s power production and ultimately degrade the racecar’s performance. From a consistency standpoint this isn’t necessarily a bad thing because the water vapor content in the atmosphere doesn’t typically change much on a given race day. To monitor and predict you must have an absolute measure of the water vapor. This is not to be confused with relative humidity. Relative humidity doesn’t give an absolute measure of the water vapor because it is “relative” to the current temperature. Good measures of absolute water vapor are dew point, vapor pressure and water grains. Most weather stations on the market take at least one of these measurements and if you run alcohol in your engine you need to pay special attention to these measurements and note how they affect your racecar. We don’t want to leave out barometric pressure, as it is the last of “The Big Three”. Barometric pressure varies with the weather and typically the weather can make the barometer change 0.5 during the race season (unless you are in a hurricane, of course). It is a given that a race car is slower at the higher elevation tracks but do most people really understand why? It is due to the fact that elevation significantly lowers the barometer at a much higher rate than the weather does. Each 100ft in elevation is equal to about 0.11 on the barometer. So a track that has an elevation of 2000’ would automatically have a barometer reading that is 2.2 lower than that of a sea level track (given the same weather conditions). Earlier we said alcohol and gasoline were affected the same by this variable and this is easy to grasp if you think of pressure in regards to as to how an internal combustion engine works. The lower pressure in a barometer reading means that the air density of the intake charge in the combustion chamber is less because the lower pressure caused less “air” to enter. This is due to less pressure behind the intake valve when it opens and the piston starts going down the bore. The intake valve is only open so long and lower pressure means the volume of air entering the chamber is less. This is unchanged whether it be an alcohol or gasoline burning engine. At this point you may be thinking to yourself “what is the big deal” if gasoline is more affected by common weather changes than alcohol. After all, I can change my jetting from race to race and the performance change is predictable so I can change my dial-in or throttle stop settings on the fly. For this we offer a couple very important things to ponder that relate primarily to your torque converter. Since an alcohol fueled engine’s power output changes less with weather changes so does the stall of the torque converter. Our findings are that, because of “Seasonal Performance”, a torque converter’s stall changes approximately half as much behind an alcohol fueled engine compared to a gasoline fueled engine during a racing season. This is a bigger deal than most racers realize and this by itself will make a gasoline combination react more to the weather. We won’t go into the reasons why here but it is our experience from looking over hundreds of fuel injection questionnaire sheets that most drag racers utilize converters that are too tight for their application. Couple this with the “Seasonal Performance” loss in the summer of a gasoline powered engine and you have a combination that is easily pulled out of its power band causing the performance loss to be even more profound and ultimately harder to predict. Along those same lines we believe that one of the reasons that racers switching from gasoline to alcohol typically see enhanced performance across the board is due to the fact that the alcohol raises mid-range power which, in turn, stalls the converter higher freeing up the engine and making it more consistent. There is one last important characteristic of alcohol that we at KillerRONS.COM are working hard at researching and collecting data on and will follow-up with readers at a later date but we will touch on here. This is in regards to the superior cooling effect that alcohol has on a racing engine. The high oxygen content mentioned earlier is also what gives alcohol its superb “cooling effect” capabilities. This is because the oxygen introduced as part of the alcohol fuel raises the latent heat of evaporation within the engine. In layman’s terms this means that heat energy is removed from the engine when the alcohol changes states from a liquid to a gas. Alcohol has nearly ten times the cooling-effect as gasoline. This is the reason that alcohol engines run cooler and ultimately place significantly less demands on the racecar’s cooling and battery systems. Alcohol runs cool enough that it is common to not need the fan to aid in cooling the engine. Between round chores are as simple as fueling it back up and mentally preparing for the next round. This can become extremely important in the summer-time months in round robin style bracket racing and we believe this, along with “Seasonal Performance, is why our customers see such a dramatic improvement in their late round finishes when switching to alcohol. We hope this article gives you a better understanding of how alcohol relates to your engine and hopefully you learned something that may help you win an extra round or two during a race or a season. There are many ways to introduce alcohol into your engine whether it be through alcohol carburetors, mechanical fuel injection units or electronic fuel injection units. Regardless of which induction you have or will choose we hope your experience with alcohol is a good one and you proudly consider yourself an “Alcohol Racer” and become one of the minority that wins the majority.